Hard to believe that National Gingerbread Day is celebrated in June instead of December, but since today is National Gingerbread Day, I thought that this would be a great day to re-publish this previous post about Torunskie pierniki. Muzeum Piernika, the Museum of Torun Gingerbread, is the former factory of Gustav Weese, a family who has baked pierniki there for generations…and the only museum dedicated to gingerbread in Europe. 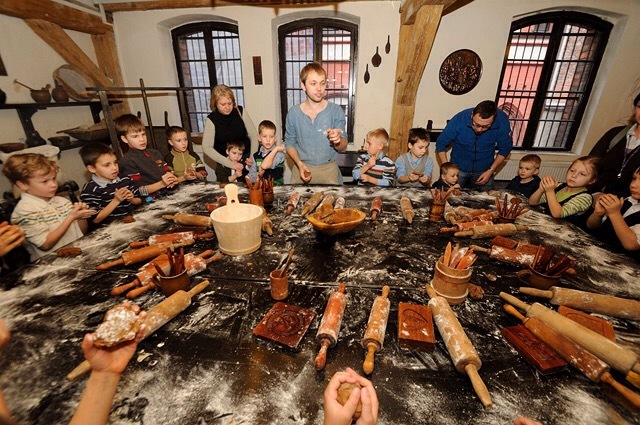 Visitors to the museum take part in an interactive show which teaches them how the dough was made in theMiddle Ages…how to make their own gingerbread using traditional baking molds…and how flour is produced using millstones. Great pierniki are all about the proper blend of spices: Too much ginger or pepper will make the cookies too spicy. Too much cinnamon will make them too sweet. Training for the job of gingerbread master was once comparable to the training as a sommelier….but here is a gingerbread recipe well worth making in months other than December. Cream together…3/4C softened butter…1-1/2C brown sugar. Add…1C molasses…2 eggs…1Tbsp maple extract. Add the flour mixture in three batches, beating until just combined after each addition. Wrap the dough in plastic wrap. Refrigerate for at least two hours. Remove the dough from the fridge. Divide the dough in half once dough is soft enough to roll but still firm. Roll out each half between two sheets of plastic wrap. 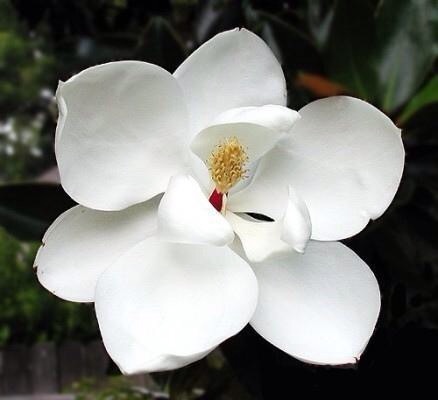 Place on a baking sheet lined with parchment paper or a baking mat. Bake 5min, Remove with a spatula. Let cool completely. Transfer to a piping bag fitted with a fine tip or a squirt bottle. Decorate the cookies with miscellaneous candies, sprinkles, and so forth…using icing as an accent and as glue to hold on the candies. Allow icing to set before transporting or serving. Gingerbread has a long history and has become part of Christmas traditions throughout the world. in 992 gingerbread was brought to Europe by the Armenian monk Gregory of Nicopolis who had left Nicopolis Pompeii, to live in France. He taught gingerbread baking to French Christians. 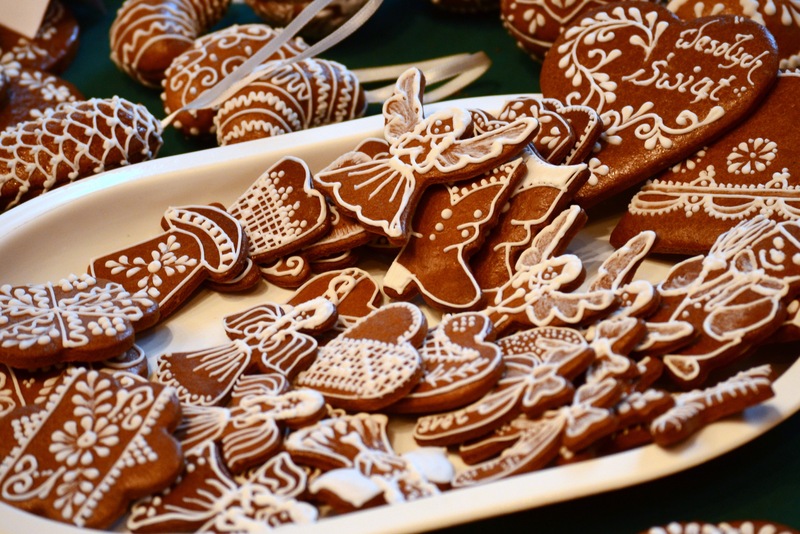 in the 13th century, gingerbread was brought to Sweden by German immigrants. Early references from the Vadstena Abbey show how Swedish nuns baked gingerbread to ease indigestion. During the 17th century gingerbread was sold in monasteries, pharmacies, and town square farmers’ markets for medicinal properties. During the 18th century, the town of Market Drayton in Shropshire, England became known for its gingerbread and started displaying gingerbread on welcome signs to their town. Although ginger had been stocked in high street businesses there since the 1640, the first record of gingerbread being baked in the town was not until 1793. Gingerbread men have played an important role in childhood culture and memories for centuries. Almost everyone remembers the fairy tale about a gingerbread man who comes to life, outruns an elderly couple, and is finally devoured by a fox. In 1892, Tchaikovsky wrote his famous ballet The Nutcracker, portraying the Nutcracker leading an army of gingerbread men in a battle against the Mouse King and his fellows. In 1945 the game Candy Land was released…starring “The Gingerbread People” as the main characters. Shrek movies include a talking gingerbread man named Gingy in the cast. 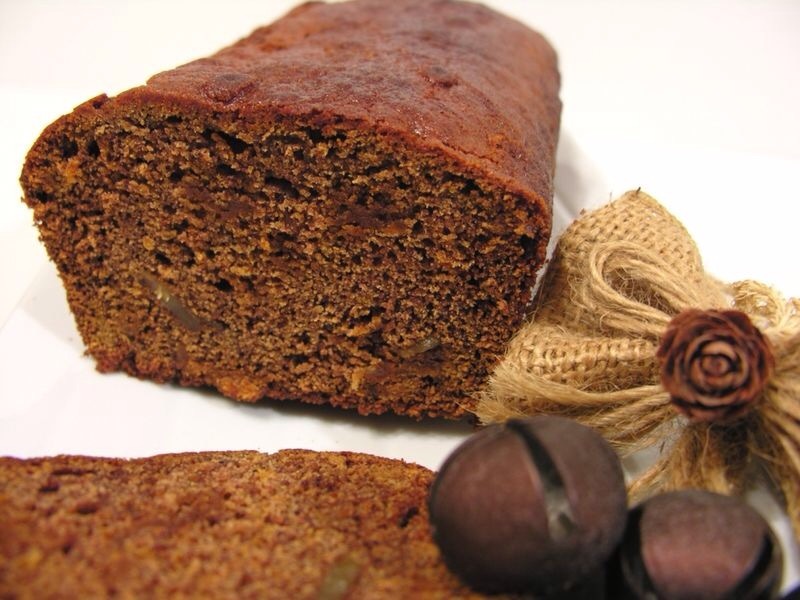 In England, gingerbread is commonly known as Parkin, a soft gingerbread cake made with oatmeal and black treacle. Molasses was first used by apothecaries to make the medicine theriaca, from which name the word “treacle”…so treacle is actually molasses. Parkin was the food of the poor. Ovens were rare in the houses of the poor, and so they cooked these cakes on griddles or bakestones over an open fire. Oats were also the staple grain for the poor, even though thought of as animal feed for the upper classes. Parkin is traditionally eaten on Guy Fawkes Night or Bonfire Night, November 5th…a celebration of the great failure of Guy Fawkes to blow up the Houses on Parliament in 1605. Make a well in the centre of the dry ingredients. Pour in the milk mixture. Mix ingredients together with a spoon until fully incorporated. Pour the mixture into the prepared pan. Bake for 1 1/2 hours. Remove from the oven. Let cool fully on a wire rack. In France…Pain d’épices, a honey spice cake and a speciality of the Alsace region, has been around for hundreds of years. Traditional recipes for pain d’épices call for mixing honey and rye flour into a pâte-mère (mother dough) and leaving the dough in a wooden trough to rest in a cool place for months. Traditional pain d’épices is sweetened entirely with honey, and the loaves can often be purchased from French honey merchants. Preheat oven to 325 degrees. Prep springform or loaf pan. Beat together…1¼C honey…1C brown sugar…¾C boiling water. Add 1Tbsp baking soda…½ tsp fine sea salt. Beat 2min more on medium speed. Reduce the speed on the mixer to slow. Mix until everything is well incorporated. Scrape the batter into the pan. Bake one hour. Let cool before wrapping well in plastic. Note…Julia recommends waiting at least a day or more before serving. For the best flavor and texture, age the cake for two weeks in the refrigerator or one month in the freezer. In Germany gingerbread is often called Lebkuchen and sold at carnivals and street markets, especially Christkindlmarkts. As early as 1296 Lebkuchen had been invented by monks in Franconia, Germany…and Lebkuchen bakeries were started in towns like Ulm and Nürnberg. Today Nürnberg is especially famous for the export of Nürnberger Lebkuchen. Lebkuchen is sometimes packaged in richly decorated tins, chests, and boxes, which have become nostalgic collector items. Hexenhäuschen (“witch houses”)…made popular because of the fairy tales about Hansel and Gretel. Honigkuchenpferd (“honey cake horse”)….the closest German equivalent of the gingerbread man. Lebkuchenherzen (“Lebkuchen hearts”), cut-out hearts usually inscribed with icing and sold at German regional fairs and Christmas markets, and Oktoberfest. Whisk together 3/4C flour…1/2tsp baking powder…1/4tsp salt…1/2tsp cinnamon…1/2tsp ginger…1/2tsp ground cloves. Add…3 ounces crumbled almond paste…1/3 cup apricot jam…3 large eggs…3/4 cup packed light-brown sugar. Blanche, toast, and then finely chop 3/4C blanched whole almonds…1/3C blanched hazelnuts. Finely chop 1/3C candied orange peel, 1/3C candied lemon peel, 4 pitted Medjool dates. Add these to the batter. Transfer dough to an airtight container. Refrigerate overnight. To bake…Drop dough onto parchment-lined baking sheets, using a 1/4-cup scoop and spacing cookies 3″ apart. Place 3 almonds close together on top of each cookie. Bake at 325 until golden brown, about 14 minutes. Let cool completely on sheets on wire racks. To ice…Whisk together powdered sugar and milk. Brush over cooled cookies. Let stand until set.